In part 3 we discussed how the MCS-1-RF wireless window mounted light sensor can be linked to our radio equipped blind and shade motors using RF (Radio Frequency). In part 4, we will learn how to configure the light sensing operations. Please note that this system is very flexible in that the motor operation can be reversed. This means that if you are attempting to block bright sunlight, you can close the blinds when the light gets bright, and open them if it becomes cloudy. If you are using it to close the blinds at dusk and open them at dawn, just reverse the motor operation. You can also use this sensor with a timer to facilitate light sensitive operation for blind & shade control AND timed operation. At this point the battery should be inserted into the battery compartment, with the light sensor unit powered up. If you press the Up/Down/Stop test button, the LED should flash. During normal operation, the Up/Down/Stop button acts as a manual over-ride control, allowing you to directly operate the blind as need be. You can think of it as a wall mounted remote control. 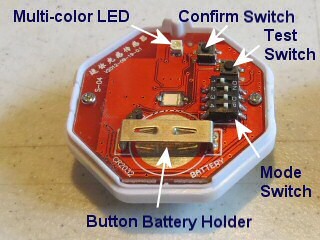 The sequence is Roller UP (red LED), Roller STOP (red + green LED), Roller DOWN (green LED), Roller STOP (red + green LED). The picture at left is a detailed view of the internal circuit board (cover removed) and all the controls and switches used at various different times during the programming process. When calibrating the light thresholds, remember to point the back of the sensor with the suction cup towards your light source. Typically, the suction cup on the back will be stuck onto a window pane. Switch 1 is used for indicating if the unit is in setting mode or normal operation. The setting mode is 0 (right position, as per pictures below), the normal operating mode is engaged when it is in position 1 (the left position, as per pictures below). The other switches are used in combination to activate specific modes, according to the table below. The first step is to move switch 1 to the setting position, then move the others accordingly. The sensor will send out signals within 10 seconds when the switch is placed at the 0 position, to indicate the end of the setting interval, so you should try to set the other switches within that time frame. If you don't finish the settings within that time, please move it back to normal, then back into setting mode to start over. When finished adjusting the configuration of switches 2, 3, and 4, move switch 1 back to position 1 to engage normal operation. The switch settings below show the switch position patterns in the various operating modes. 1. 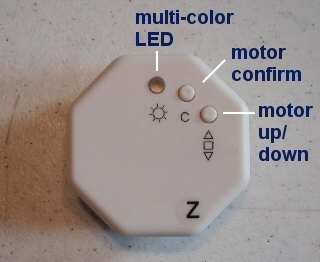 Start with sensor exposed to bright light, place the switch in the positions as shown on the left (mode A). Switches 1, 2, and 4 should be on the right. 4. Save by changing switch 2 from 0 to 1. Indicator will turn off, the adjustment is confirmed and adjustment has been finished (mode B). 5. Test by changing switch 2 from 1 to 0 (mode A). Move the sensor from strong light environment (over 20,000 LUX) to weak light environment again (less than 15,000 LUX), sensor will send out wireless signal to programmed motor automatically within 10 seconds. 6A. Continue Programming, if you plan to also make it activate when it gets light. Please skip the next step (6B), leaving it in programming mode and proceed to step 1 in the next section. If you plan to make it function only when it gets dark, please end the programming by proceeding with the next step (setting it in normal operation mode). 1. Start with sensor exposed to weak light, place the switch in the positions as shown on the left (mode A). Switches 1, 3, and 4 should be on the right. 4. Save by changing switch 3 from 0 to 1. Indicator will turn off, the adjustment is confirmed and adjustment has been finished (mode B). 5. Test by changing switch 3 from 1 to 0 (mode A). Move the sensor from weak light environment (under 15,000 LUX) to strong light environment again (more than 20,000 LUX), sensor will send out wireless activation signal to programmed motor automatically within 10 seconds. 6B. Set Normal Operating Mode (Weak and Strong Light) by setting switches as per following picture (mode D). Mode D Strong light & weak light automatic control The blind is activated in one direction when it gets dark, and activated in the other when it gets light. This is useful if you want your blinds to activate at dawn and dusk automatically. Light sensor unit disabled The light sensor does not issue any motor commands.